Today I would like to draw attention to one of my favorite blogs. I don't know how I came by this blog but I know it was through crochet. I just love the kittens! The stories about them are fantastic. 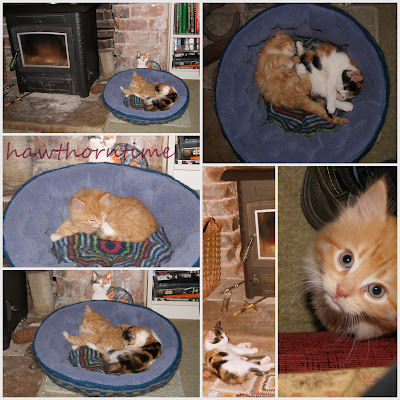 The great thing about this blog is there is fantastic crochet/walks/photos/other crafts & the Kittens. Please go over and take a look! Hello Susan, I want to personally thank you for becoming a follower of my blog and to apologize for it taking me awhile to see that. My husband has been taking a lot of my time and he just received a bone marrow transplant last week. Needless to say I have spent a bit of time in blog land, but just now concentrating on the details. I am now your newest follower as well. It looks like we crocheters find each other sooner or later. I will be back to check out the fun you are having in your corner of the world. Hello, following from the blog hope! Would you care to follow back? Hawthorne - your world is fantastic! Dawny - aren't they just! I'm a dog person normally but these two have made me want to get my own kitten. Hubby would have a fit if I did. Susanne - Don't worry you are going through so much at the moment. You look after you and hubby! Krystimarie - I'm following your blog.